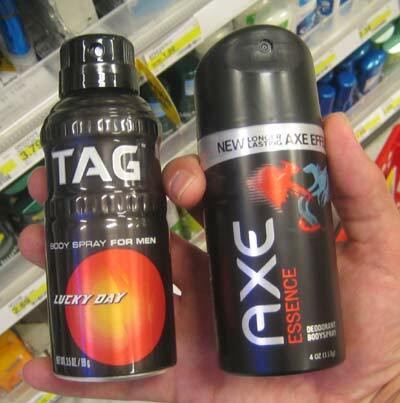 Did anyone besides Stacy notice that AXE and TAG body sprays for men are actually two different products? Usually, when a product gets copied, it is easy to separate the original from the copycat version. In this case, I'm not sure which product arrived first. 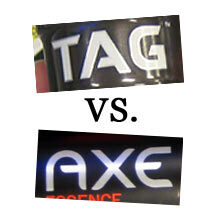 From Unilever website: AXE is a deodorant body spray that helps keep guys smelling great. It�s a deodorant with a seductive fragrance that is meant to be used everyday, not just on special occasions. 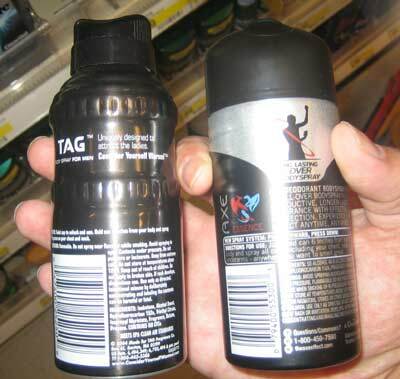 Unlike a standard deodorant (the one your dad used), it�s for the whole upper body and it comes in six great fragrances. From Gilette's consideryourselfwarned.com: Hope you've got a lot of stamina there, fella. Because After Hours of being Kissed, pawed and passed around amongst the ladies, you'll feel like you're a competitor in the Olympics of Love. I'm sure either would taste great on a burger from Carl's Jr.
UPDATE: A few people wrote to help with AXE / TAG history.